Amersham™ Typhoon™ NIR Plus is the latest modular and upgradable near-infrared imaging system from GE Healthcare’s Life Sciences business. NIR Plus’ three-laser flexible configuration provides two essential NIR channels, as well as a third visible laser channel for triplex protein detection to facilitate normalization and the reduction of blot-to- blot variation, saving valuable research time. Ideal for multiuser environments, it delivers extremely sensitive detection, high image resolution, and a very broad linear dynamic range with multi-fluorescent, and stained samples. Able to scan up to 9 microtiter plates simultaneously, it is also suitable for high-throughput screening, and enables the detection of distinct, high-resolution bands in Western blotting. NIR Plus is an affordable, user-friendly, open imaging platform that is compatible with most commercially-available NIR detection reagents. Its open-format data files enables direct analysis with commonly used image analysis software such as ImageJ. 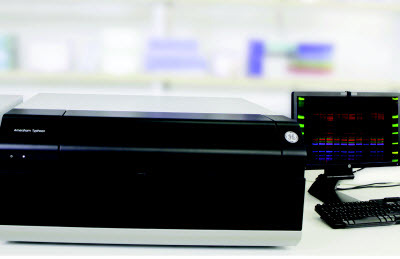 NIR Plus accommodates a wide range of diverse samples with high (10 µm) resolution, a dynamic range of greater than 5 orders of magnitude, and high sensitivity of as low as 3 pg, including tissue sections, plant leaves, and cell colonies in addition to traditional gels, membranes, multi-well plates and dishes.